The Rural Payments Agency announced on 19 March that farmers and agents will be offered the use of established forms and processes to complete their claims. Apart from registering, farmers will not be asked to enter any further data online on the Rural Payments service now. Data that has already been entered onto the service has been saved and will be used. If you haven’t already registered on the Rural Payments service, do so now by going to www.gov.uk/ruralpayments or calling 03000 200 301. You must register to be able to claim. 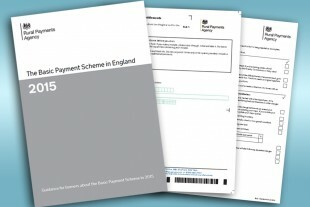 From today (23 March), there is new guidance on GOV.UK on how to apply for the Basic Payment Scheme, including a Basic Payment Scheme claim form (BP5) and associated guidance note. We’re not asking you to complete this form, it’s just to help you prepare and see what the form looks like, as during April, we’ll send pre-populated BP5 claim forms to all farmers and agents who have registered on the Rural Payment service. All you then need to do before the deadline, if you don’t need to make changes, is check the form and confirm to us that it’s correct. If you do need to make any changes to your land or entitlements, you can now download an RLE1 form. Further information is contained in the RPA's Press Release. We are also contacting all farmers and agents registered on the Rural Payments service to update them. We'll update other information in the pages on this blog shortly. "All you then need to do before the deadline, if you don’t need to make changes, is check the form and confirm to us that it’s correct"
surely for a substantial amount of farmers there will be part D to complete? Yes, some customers will need to complete Part D of the form as we won’t be able to pre-populate it for everyone when we send forms to customers in April. If customers need support to complete Part D – or any part of the claim process – they’ll be able to get help, including attending an appointment at one of the 50 RPA drop-in centres. 1. Sorry am now becoming confused, I was part way through the online BPS submission, and started to record field maps, although many parcels were saying checked, I still needed to go back to them as they were not finalised, as at the time I could not alter field boundry. Is this information going to be used, as stated in your mailing today? 2. Do you intend to run courses on how to fill in the paper application, as although I have done this before it was not as complicated as the one you now need, with reference to greening, and EFA? On the BPS claim form there is mention of continuation booklets but I can not find a download for these, are these to be added or do we print off extra field data sheets and add these to the application. Thank you for your feedback, we will be adding an option to download these soon. It’s important to note that if you have claimed SPS before, we aren’t asking you to fill out the blank BP5 form – we’ve just provided it so you can see what it looks like – in April we will send you a personalised, pre-populated form for your businesses. Agree . Continuation sheets need to be able to be downloaded. Just tried to find location of nearest drop in centre . Could not have been more difficult ended up phoning help line and it took them 5 minutes to navigate to the map which has a location map with a dot on it. There needs to be an obvious link to it and then full addresses and hours of opening so forms can start to be delivered. Again not thought through with your customers in mind. Thank you for your feedback, we are currently looking at the best way to promote our drop-in centres to customers and will be providing this information as soon as possible. 'Thousands get ready to'...........wait for it.....Fill in old fashioned paper !! What is the deadline to register. I can't find it on the website. There is no deadline to register but you must register to be able to submit claims for rural payments such as the Basic Payment Scheme. The deadline for submitting a claim for that scheme is midnight on 15 June and you must register in order to receive a pre-populated claim form. Why have none of these questions been answered? I would like to know when new RLE/1 guidance will be available. Given that so many changes now have to be made using these, we need to be getting on with it. We hope to publish updated guidance next week (w/c 13 April). You can use the existing guidance and RLE1 form on GOV.UK to tell us about land changes or transfer entitlements. The main updates to the guidance will be to remove references to the Single Payment Scheme and make it clearer where you need to use a RLE 1 if you are updating a BP5 application form we have filled in for you. There seems to be no mention in the new RLE1 guidance or on the form on how to transfer land that has commons rights attached? So I have used the old form as there is a question at B6 about common land. I have included a covering letter with the number of rights that need to be transferred and all the common info, I presume you will calculate a notional area and transfer the correct number of entitlements for me?? Also all of my clients with common land rights have had the commons put in part C of the form, I guess we just delete the lines, a lot of lines! When will the certification forms be available online for ''young'' or ''new'' farmers to have independently signed together with the list of documents required as there is no mention of this in the guidance for the basic premium scheme booklet apart from saying it will available from Gov.UK. So come on get these forms on the internet for downloading as they are needed now not in a few weeks time .